Today’s interview comes from the offices of Monolith Soft1, located near Nakameguro station in Tokyo. I actually lived in Nakameguro for about five years in total, renting a place here from my fourth year at university right through the first few years after graduation. 1Monolith Soft: Monolith Software Inc. is a software developer founded in 1999. In addition to the Xenosaga series, the company has developed games such as Disaster: Day of Crisis for Wii and Soma Bringer for Nintendo DS. All of these high-rise buildings weren’t here back in those days, so I’m really taken aback by how much the area around the station has changed. Still, I’ve really been looking forward to coming back to my old stomping ground. Anyway, thank you all for joining me today. Now, Takahashi-san, you have a great many titles to your credit. This time round, you were Executive Director, weren’t you? That’s right. I was involved in every aspect of the game, from coming up with the original concept and writing the script, right through to the debugging stage. 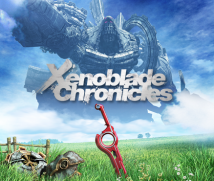 In this interview, I’m talking to the team behind the music for Xenoblade Chronicles. Could I start by getting you to say a little about the musicians gathered here today? You go back a long way, don’t you? Mi-chan? (laughs) So you call Mitsuda-san Mi-chan. So what does he call Takahashi-san, I wonder? That’s right! (laughs) This title has ‘Xeno’2 in its name and so partly for that reason, I got Mi-chan to work on the music for the epilogue. 2‘Xeno’ was used in the titles of two RPGs that Tetsuya Takahashi directed: Xenogears (1998) and the Xenosaga trilogy (2002-2006). 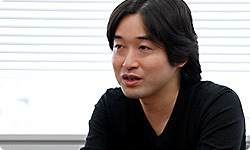 Yasunori Mitsuda was responsible for the music in Xenogears and Xenosaga Episode I: Der Wille zur Macht. So as you’d used ‘Xeno’ in the title, you felt that it should close with a song by Mitsuda-san. Exactly. For that all-important final song, Mi-chan was the only man for the job. I’ve had a lot of opportunities to work with Mi-chan, and I’ve always felt that the music has played a really redemptive role. That’s why I decided to ask him to work on this vital section. When you hear that your music has ‘played a redemptive role’, how does that make you feel, Mitsuda-san? ...Well, it makes me happy, of course. It’s that simple. I think at heart, games are something that you enjoy via a combination of your eyes, ears and the feel of the controller in your hands. I always try to be aware of the importance of taking the music and making that element fit in with the images and story, enhancing the player’s emotional response. As for Shimomura-san, this was actually the first time that I’ve had the opportunity to work with her directly. But you did know each other before, right? Right. We had both worked at Square (now Square Enix) at the same time, but we didn’t really know each other. So this was the first time that you’d properly worked together. For Xenoblade, I wanted to try a lot of new ideas without being bound by any pre-existing concept of what an RPG should be. This also applied to the game’s audio content and I wanted to create a different atmosphere to that of titles I’d worked on previously. So I asked Shimomura-san to come up with tracks, including the main theme and the opening song. Shimomura-san, how did you find working alongside Takahashi-san for the first time? I’d originally had the impression that Takahashi-san would be a really difficult person to work with, and I was rather nervous, thinking that he would make some very severe demands of me. But when I actually came to work with him, it wasn’t like that at all. He has a very clear vision of what he wants in his games, which means that if, for example, I was a bit sloppy and thought ‘Well, I’d like to do it like this, but I haven’t really got time, so I’ll just do this and we can fix it later’, he’d pick up on it right away. I’ve heard similar stories at Nintendo. If someone directly criticises something that you’re not entirely confident about, it can come as a shock. But at the same time, you also feel that the person understands what’s needed. That’s just it. I’d feel that he could see right through me, as if he really was paying attention. In that sense, I really had a lot of confidence in him, and I enjoyed working on this project. 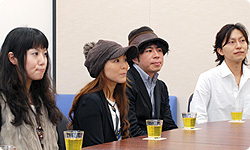 This was also the first time I’d worked with Kiyota-san and the three-person team of Ace+. I asked Dog Ear Records3 to work on the music this time round, and they suggested I try this really good team they knew. I asked Kiyota-san to work on songs for the event and field sections, while Ace+ worked on other parts, including the battle music. 3Dog Ear Records is a music company founded by Nobuo Uematsu in 2006. 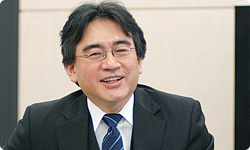 The company has created the music for games including titles in the Final Fantasy series. Thank you for joining me. Now before we discuss Xenoblade Chronicles, could you tell me how you got into making music for video games? Let’s start with you, Shimomura-san. Okay, well this is going to bring back some bad memories, but when I was learning piano as a student, I got hooked on Super Mario Bros.4 and really overdid it, playing it all night. I then went to an important piano lesson and my teacher asked me why I wasn’t able to move my hands... 4Super Mario Bros. is a platform game released for the Famicom in Japan in September 1985. So you really loved games that much! (laughs) You then went on to work on writing the songs for Street Fighter II5 and a large number of other titles after that. You’ve worked on Nintendo games like Super Smash Bros. Brawl6, for which you did the arrangement, and Mario & Luigi: Superstar Saga7. 5Street Fighter II is a fighting game developed by Capcom, released as an arcade game in 1991, and for the Super Famicom in Japan in June 1992. 6Super Smash Bros. Brawl was released in January 2008 in Japan for Wii as the third in the series of fighting games. 7Mario & Luigi: Superstar Saga is an action RPG released in Japan for Game Boy Advance in November 2003. That’s right. I really feel I got lucky. I was able to enter the gaming world despite having hardly any compositional experience. I initially assumed I’d be quitting after three years or so, but in the end, thanks to the support of a whole host of people, I’ve been able to enjoy a lengthy career. Let’s turn now to you, Mitsuda-san. Well, this goes back to my student days, but I was always in charge of the sound effects in the theatre. So your background is in sound effects on the stage? That’s right. I had a lot of friends who were actors, and I would work on songs for plays, and add sound effects. I did that work on the side when I was at college. Then by chance, someone who was a mentor to me ended up working with Enix (now Square Enix) and I helped out with the sound effects. Then when I was asked where I wanted to work, I said that I hadn’t thought about it at all. Right at that moment, I flicked through a games magazine that was lying there and I saw that Square was recruiting. My mentor suggested I give it a go, and they ended up hiring me. So it was really just a stroke of luck that you ended up working for Square. It really was. But I had always liked games. Fate is a funny thing, isn’t it? When you did sound effects in the theatre, did you use computers at all? Yes, I did. I liked computers and used them to make sounds. But because I’d always worked on sound effects, when I first joined Square, they didn’t let me compose music. But I wanted to try it, so I talked Hironobu Sakaguchi-san8 into letting me take charge of Chrono Trigger9. 8Hironobu Sakaguchi created Final Fantasy and is CEO of Mistwalker Corporation. 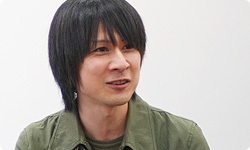 He was director of The Last Story, released in Japan for Wii in January 2011. 9Chrono Trigger is an RPG released in Japan in March 1995 for the Super Famicom. Published by Square (now Square Enix), it was ported to the Nintendo DS system in November 2008 in Japan. I worked as graphics director on Chrono Trigger. And Mi-chan and Taka-san have worked together ever since. That’s right. When you put it like that, I realise that I’ve been working with Taka-san for a long time. After Chrono Trigger, I kept working on music composition, and I’ve been able to continue working on games. I really feel lucky, and I’m grateful to all of you.